At Polk State College, students have the opportunity to receive a world-class education in The Arts that prepares them for careers in which they utilize their talents or the pursuit of higher degrees at top art institutions. The College’s transfer track in art allows students to fulfill requirements for a Polk State Associate in Arts (AA) degree while studying visual arts, preparing them for Bachelor of Arts (BA) or Bachelor of Fine Arts (BFA) degree programs in concentrations including photography, drawing, painting, studio art, ceramics, sculpture, and even video game design. 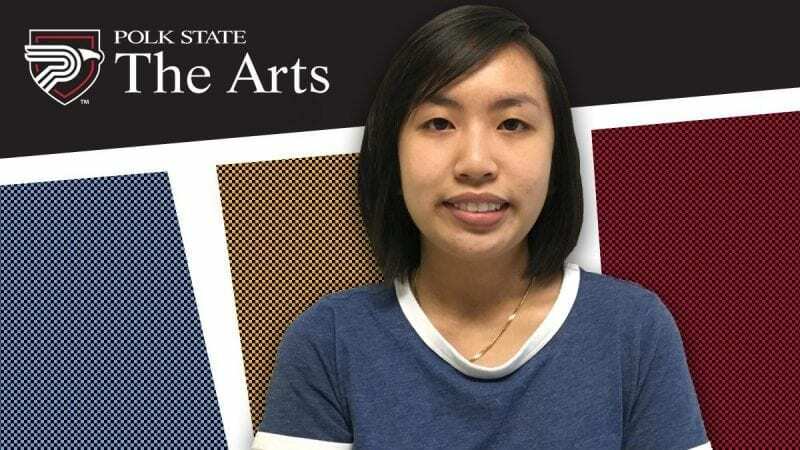 Tammy Nguyen received her AA in May with Polk State’s 118th class and is now pursuing a BFA in digital arts at the DigiPen Institute of Technology. The Princeton Review ranks the school in Redmond, Washington, No. 3 in the U.S., Canada, and abroad for undergraduate game design. “I’ve always loved drawing and playing video games, but video game design really didn’t become a career path for me until I started at Polk State,” said Nguyen, who enrolled at Polk State Chain of Lakes Collegiate High School in 11th grade. The College operates three charter high schools and also offers dual enrollment and early admission. She exhibited her art in five College shows and received two honorable mentions for her work. Nguyen explained that thanks to the instruction she received at the College, she is now able to draw more realistically. She noted that she has learned anatomy and other subjects that allow her to take her drawings from 2D to 3D and life-like. This helped Nguyen put together her portfolio for DigiPen, which required pieces that illustrated her ability to draw realistically, including a self-portrait. She aspires to work for a large video game company one day and is hopeful she will land a gig like many of DigiPen’s graduates, who have gone on to work for Nintendo Software Technology, Valve Corporation, Electronic Arts, and more. Polk State College’s The Arts includes Music, Theatre, and Visual Arts. In addition to academic studies, each area offers students numerous performance and exhibition opportunities throughout Polk County. For more information, go online to www.polk.edu/the-arts.